DESCRIPTION: ...Stunning Mediterranean style home filled with top of the line amenities. Easy stroll to sand, strand, ocean and downtown Manhattan Beach. Master suite with own ocean view, limestone deck, large walk-in closet and bathroom with heated stone floors. Top floor offers to living areas, gourmet kitchen, vaulted wood-beam ceilings and 2 ocean view decks. YOUR MAMAS NOTES: Thanks to Princess Sandypants from Manhattan Beach (that's in Southern Calee-fornya children, not New York City), Your Mama has learned that Mister Derek Lowe, formerly of the Red Sox and currently pitching balls for the L.A. Dodgers, has put his Mediterranean style Manhattan Beach house on the market with an asking price of $5,700,000. Naturally, not knowing a thing about sports, Your Mama phoned our good friend Fiona Trambeau, a boozy and brassy babe who knows more about men who play with with balls than anyone else Your Mama knows. When we mentioned that we had a few questions about this Mister Lowe, Fiona let out a hoot and a holler loud and long enough to take the top prize at the high-larious pig calling contest at the Iowa State Fair. Yes, she did and it about busted our ear drum. Number One: In January of 2005 he signed an eye popping 4-year contract with the L.A. Dodgers that pays him a whopping $9,000,000 per year. Number Two: After two years as the only so-so starting pitcher, he was demoted to the number two slot for the 2008 season. Presumably that does not affect his fat paycheck. And Number Three: Just a few short months after arriving in Los Angeles, the very married with children Mister Lowe began a lurid affair with a gal named Carolyn Hughes, a former pageant queen who covered the Dodgers for the folks at Fox. Each eventually left their respective spouses and reportedly shacked up in sin. But children, as inneresting and fun as it is to snicker and act all aghast about cuckolding couples, we're here to discuss the real estate and property records show that Mister Lowe scooped up this 4,260 square foot house just a half block from the Pacific Ocean in July of 2006 for $5,000,000. Listing information provided to Your Mama by Princess Sandypants reveals that the house was built in 2006 and includes four bedrooms and five bathrooms. Some of the listed five bathrooms are half bathrooms, but until we hear from Mister Lowe's terlit gurl, Your Mama can't confirm how many of those are full and how many are half bathrooms. In addition to all the bedrooms, there house includes an open plan living and dining room and a suburban style kitchen with all the granite and stainless steel hoozy goozies that rich people want nowadays. While we don't care for the cabinetry (we don't personally care for raised panels) and the carved corbels on the breakfast bar make us feel nauseated, we do appreciate that guests have a great spot to sit and get slowly and comfortably pie-eyed while the hostess prepares cheese on Triscuit hors-davors. We do like that the floors in the master bathroom are heated since coastal mornings can be rather chilly, but we're concerned about that the short flight of stairs which could be very dangerous for someone like the sometimes clumsy Dr. Cooter who has a tendency to need to get up several times in the middle of the night to pee-pee. One small slip in the night and he'd crack his head wide open on the stone floor and then our night's rest would be ruined having to take him to the damn emergency room. The two features that Your Mama likes best about this house are the three car garage (parking in these ocean front communities is murder) and the location on 19th Street just a few moments stroll to the sugar soft sand. What we don't like is that the three story house does not appear to have an elevator. This might not seem like an issue for all the spor-teef types out there, but for all the fat asses like Your Mama who would love to sit on a top floor terrace looking out towards the Pacific Ocean but don't particularly want to break a sweat to get up there, an elevator is a necessity. Is this a double lot? If not, it seems a bit pricey. Whatever the case, I'll never understand custom, high-end houses that seem to take design inspiration from insipidly themed master-planned developments. I see a listing at the below link, but do not see it on the MLS. "Each eventually left their respective spouses and reportedly moved into each other." The location is superb, but the actual home seems rather narrow and cramped. No surprise that I agree with PCH on this one. As for Mister Lowe, Ms. Trambeau's assessment of his pitching ability is quite accurate. The Dodgers over-paid for him. And baseball money, unlike football money, is generally guaranteed. Great location, I especially love the MB walk-streets. I loathe the exterior for the obvious reasons but also because this is a charming beach community - why would anyone build this style at the beach?? This house reminds me very much of the type of dwelling that exists all over the Costas in Spain and inhabited by broken-nosed gangsters from London. All that dark wood, and I am with you there Mama about the panels, makes it look like is it at least 30 years old. And for that money, being bang on top of the nay-burrs doesn't float my boat. The bathroom steps + wet feet = No, no, no. Another room has three steps down - was the property two houses at one time? Mama, I think I love you...I wish my best friend were half as cool and funny as you! P.S. 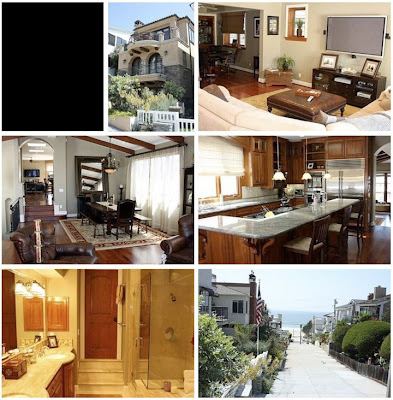 to 11:04: Manhattan Beach realtors don't use the MLS/Claw. Try looking for the house on the SoCal MLS, used by agents in the South Bay. Sorry, forgot to nod to PCH in my earlier comment, with whom I completely agree. Simon, don't be so apologetic to PCH. Once is enough!!!! Princess Sandypants? The only time I got sandy pants was when.....yeah well, it was just the once. Mama you are funny! Thank you Mama. I needed a divertissement desperately today, and you always come through. You are just a love. "…divertissement…" ––– I think I love you. This house however; um, not so much. Great location (4th from the Strand), and I'm guessing what PCH meant by a double lot ––– the aerial view shows a through the block lot, like most of its neighbors. I've been trying to come up with something nice to say, but Mama this one is just too damned painful, inside and out. Has that Coto vibe goin' on ... NEVER a good thing.